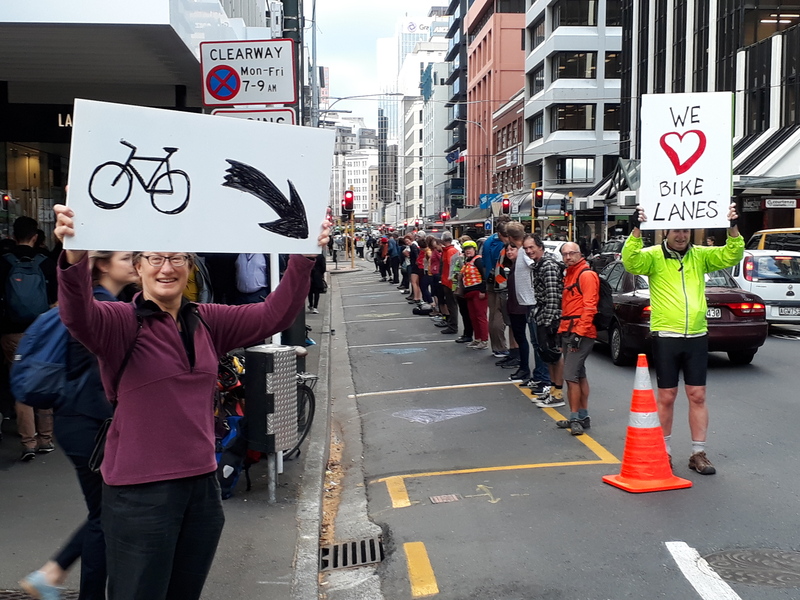 Wellington’s newest bike lane popped up on Featherston St today – just for an hour. 40 people lined the clearway to build a people-protected bike lane for two blocks. Is New Zealand ready for Vision Zero? There are 300 avoidable deaths and 12 thousand injuries per year on our roads. Why do we tolerate that? Is it time for a better way? Is it time for Vision Zero? Vision Zero is a radical road safety approach which aims to achieve a road transport system with no fatalities or serious injuries. It started in Sweden and was approved by their parliament in 1997. A core principle of Vision Zero is that ‘Life and health can never be exchanged for other benefits’ rather than the more conventional comparison between costs and benefits, where a monetary value is placed on life and health, and then that value is used to decide how much money to spend on a road network towards the benefit of decreasing how much risk. Mechanisms for change: providers and regulators must do their utmost to guarantee the safety of all citizens; they must cooperate with road users; and all three must be ready to change to achieve safety. Let’s not confuse the vision with objectives. Vision is where we want to be. Objectives are the milestones we pass on the journey. Doesn’t New Zealand’s current approach, Safer Systems, aim to reduce deaths and injuries? It lacks ambition and vison. Safer Systems appears to be ‘business as usual’ as the fear is safer (lower) speed limits will curtail economic productivity. This approach violates the first principle of Vision Zero road safety: “Human life and health are paramount and take priority over mobility and other objectives of the road traffic system”. Furthermore, it overstates the ability of the posted speed limit to generate a high throughput of motor vehicles; which is typically more influenced by the intersections, traffic lights, traffic congestion, road works, crashes, slow moving vehicles, etc. enhancing network efficiency and providing more reliable travel times for motor vehicles users. Road deaths per capita in NZ are twice that in UK, Sweden and Norway. We can do much better. What do you think? And what would success look like?